My first car was an old brown Mercury that had the annoying habit of breaking down when I needed it most. One day, as I was getting ready to drive from New York University to Northern New Jersey where I lived at the time, I put the key in the ignition, but the car just wouldn’t start. Luckily, a fellow student offered me his help. He noticed that the battery cables looked very rusty and suggested that I buy a cola at the corner coffee shop and simply pour it on the battery. I was quite incredulous, but for the 50 cents that it cost back then, I figured I had nothing to lose. I poured the drink on the battery and waited a few minutes. Much to my amazement, after a little hesitation, the car started. Indeed, the phosphoric acid in the cola worked its magic on my corroded battery connectors. Little did I know back then that the same drink that solved my car problem can wreak havoc on your bones and your body. Please share this post with family and friends so they too will know the dangers of drinking cola. dear Vivian, I have had my thyroid reomoved and am taking 3000mg of calcium a day. I would like to find a calcium that would be better for me then the one I was given and I am suppose to take it.the name of what I am taking is gramcal and you desolve it in water.it fizzes up. it also has aspartame in it? You say on page 114 to take only organic calcium. Wich is the best brand? Vivian, After watching your video on Coke with the hard boiled egg, the next video that came up was on coke with pork. It was disgusting. A worm came out of the pork. I really appreciate the information from your book and your emails, but please fix/edit your site. Thank you for saving us from awful medications. I appreciate all your help. Vinegar will do the same to the eggshell as the cola did. want to take too much. Thank you. I’ve shown this to several friends (mostly engineers) who point out this egg was immersed for a year; a Coke is in your system for less than 24 hours. To get the same results you would have to drink several Cokes a day for a year. I’m still swearing off them but it’s food for thought…. I’m certainly not defending Colas, but I wonder how the egg would have looked after a year in any liquid including water. My husband worked for a company that sold bottled “spring” water that was really just tap water. birthday cake, just a little for a polite manner. Thanks for the great video – very informing! additioal bone. This year I lost some in the hip so creeping very close to osteoporosis in that area. I HAVE THE SAME ISSUE. MY SPINE T SCORE IS IMPROVED BUT MY LEFT HIP SHOWS OSTEOPENIA. WHAT DID I DO WRONG? OTHER THAN I SUSPECT MY EXERCISES ONLY IMPROVED THE SPINE. Thanks for the video, However, to my understanding any carbonated drink, including soda-plain-water will have the same effect on bones. Carbonation isn’t the problem. 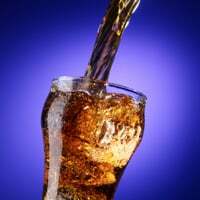 The problem is the phosphoric acid (as well as chemicals and sugar or artificial sweeteners) in colas and similar drinks. Carbonated water is perfectly OK.
You just gave me a GREAT project for my son’s Science Fair… hopefully he can demonstrate it and educate kids about the dangers of drinking soda!!! WOW! What a great DEMONSTRATION! Thank You so much for sharing it with all of us. WOW! That Was REALLY SOME DEMONSTRATION! Thank You VERY MUCH For Sharing It With Us. Wouldn’t it be great if we could have the FDA MAKE Coca-Cola and Pepsi put a WARNING label on their cans??? Hey, Michele Obama – this would be a worthwhile (finally) cause for you to undertake that would affect the health of kids and adults alike. The “finally” comment wasn’t needed. Mrs. Obama has taken on plenty of good causes. People need to use their own good judgement. I grew up in Europe, so no coca cola for me. What a hideous concoction and now we know how deadly it is for us. Have a grandson who has never touched the stuff, He’s 13 and has never had a cavity. I have just watched the video on cola. This drink should be banned. I worked for 22 years in a dental practice and the young peoples teeth were shocking after having so much cola. If you put a tooth just for a few days in a glass of cola the tooth would disolve to nothing. Frightening. I have been wondering about the effects of enzyme therapy on acidic pH. I know there is a product by enzymedica. I’m having trouble getting myself back to balance…it must be my stress or thyroid acting up. Any help would be appreciated. I’m only 54 with osteoporosis! I got the best news! I have a hip t-score of -3.1. On April 6th, my n-telepeptide test was 52. This urine test measures bone loss. Normal is 4 to 64, and you want it to be as low as possible. I started the Save our Bones program, a gluten-free diet, and an intense weight workout. I took another test on July 14h, and my tesgt results were a 23!! My doctor said my bone loss is suppressed. When I spoke to an Osteoporosis specialist, she said it was due to my diet!!! So, the gluten-free diet and the changes with Save Our Bones made the difference!!! I just dropped in to see what condition my condition is in. I am presently taking the “SaveOurBones” seriously, but still thinking like I did before I had my Bone Scan. It is sometimes heart warming to be In part of the solution. Other times it seems restrictive and harsh. Either way, i’m here to stay for the “ISavedMyBones” part. I Thank godness for Vivian and the SaveOurBones Community! Great – If only people would take note of this – only yesterday I saw a woman buy 2 diet cokes and wanted to tell her – DON’T!! what a demonstration !!!!!!!! I’m in my 80s and have NEVER even tasted cokes/colas of any kind. It’s shocking to think what these younger kids will be like in a few years with wobbly bodies that have no strong spines who walk around with a can of cola of some kind. It would be even more shocking for them if they knew where this phosporous acid came from. Several years ago my husband and brother were remodeling a horse sales barn in Ohio. A large tanker truck came in and hauled away the manure from the horse barn to be used in a cola drink of some kind. (I don’t remember if it was Coke Cola or some other company) but the driver told my husband and brother that it was going to be used in their drink. In other words this acid came from the horse manure. Of course it has been given a different name but it is horse manure/urine no matter what name the company gives it. So if you see ‘uric acid’ on a label, rest assured it is from urine of some kind. Plain carbonated water is fine, and you can add a bit of fruit juice for a healthy, refreshing drink. I could have written Joyce’s comment! I miss “fizzy” too but at what cost? This video demonstration got my attention! I too thought just 1 a week or so – what could it hurt? Guess it could hurt a lot! Why is it that so much we love (crave!) is bad for us??? Thanks for yet another eye opener Vivian! I have also used coke to remove tar on a car. Do the phosphates in some cheeses (those that melt) have the same effect? Some cheeses contain disodium or trisodium phosphate, which is a a sodium salt of phosphoric acid. In a lab, mixing sodium hydroxide with phosphoric acid will yield these products. That’s one reason I recommend eating natural cheeses. Clicked the Facebook Like button and a link to your page was not posted to my site. else. I have not had a cola in over 50 years and I’m in my 70’s.